The Rols 10 Tp bread slicer is provided of an inclination which makes a slope between the blades and the piece to slice, being the slice cleaner and more perfect in all types of bread. Moreover they have the major capacity, suitable for big breads like country bread, which added to it advanced design, high quality in construction, and metallic finish with a choice of colours, turn them into a real 10 machines. Table model. 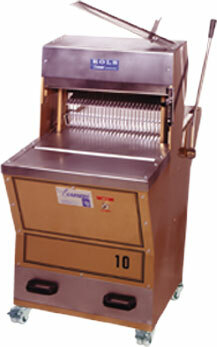 This machine is appropiate to place in shops, thanks to the small sizes the machine. Device attached for bagging the bread. Opcionalmente se suministra con una mesa con ruedas. Patented adjusting device for cutting loaves of differents heights.This machine it is made in three different versions of 43, 53 and 60 cm. According to the slicer’s zone width, which permit slice up breads which their maximum length is 40, 50 and 60 cm. 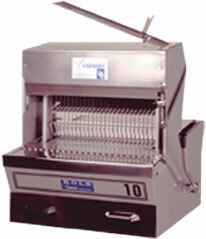 Stainless steel tray for inserting and removing loaves.